Owners, Randy and Monica Gaspar, with their family. Randy Gaspar has worked in professional sports for the past 25 years with the Phoenix Suns, the Arizona Cardinals and the Arizona Rattlers. He has been an intern, team assistant, equipment manager and in the off season he also worked in the Team Shop in merchandise sales. He has extensive experience in ordering apparel, uniforms and equipment for these various teams and for the Team Shop. 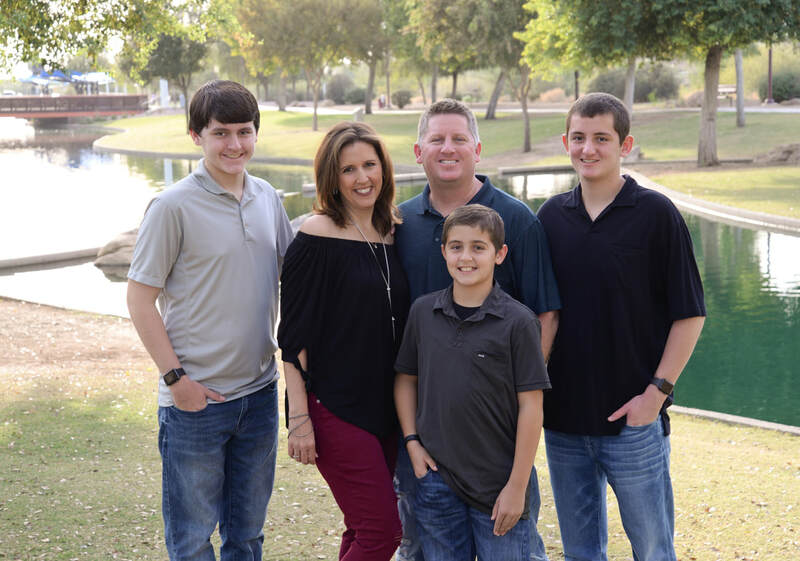 Monica Gaspar has been a competitive high school cheerleading and dance coach for over 20 years at Xavier College Prep while staying at home to raise her 3 boys, Jonathan, Jacob and Jordan. In her years at Xavier, one of her responsibilities was to order apparel, uniforms and promotional products for her teams. In 2009 they took all of their experience in coaching and working in athletics to create their own business. It started with screen printing and as they grew, they knew that they needed to do more. They added embroidery, rhinestones and glitter to their services. Monica has always had a passion for creating and design while Randy knows about business and the products they decorate. Together they make Bling 'n' Ink!